Alisa Meredith and I sat down to talk about the things that happened with Pinterest in 2016. We haven’t ordered our list in any specific way; rather we want to talk through some of the changes we saw and how they affected us and others. So let’s get started! Profiles – Pinterest changed the look of the desktop profile at least 3 times over the past year. While Pinterest says they are trying to make profiles uniform across all devices, with 80% of users being Mobile users, it seems like a lot of effort for just 20% of us on desktop. Lesson learned – don’t spend a lot of time creating fancy board covers, only to come back a week later and see that they’ve changed everything again. Hence this post needs updating with dimensions. Promoted Pins -There were many changes to the Ads Manager on Pinterest this year, beginning with adding Interests, followed by Engagement and Awareness campaigns. Because the large brands were let in on these first, the amount you have to spend on these campaigns is unreachable for most smaller businesses. Here are all the Simple Pin posts talking about Promoted Pins. Buyable Pins – 2016 was the year when Buyable Pins became Promotable! 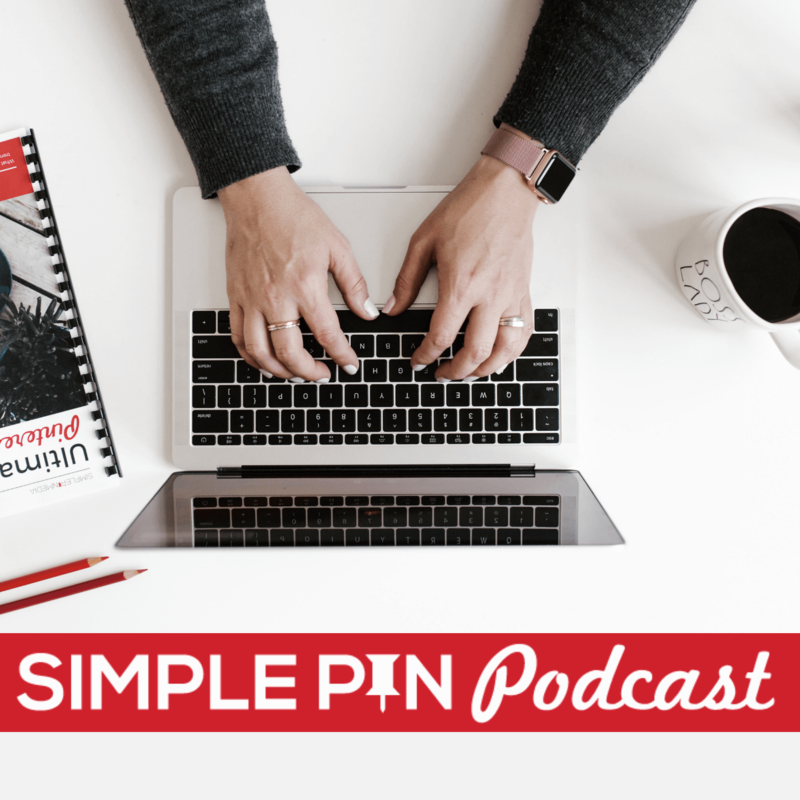 We have a whole episode on selling products on Pinterest using buyable Pins. It will be interesting to see if Buyable Pins remain a usable way for people to grow their business. Mobile Update – March and April saw traffic completely crash for many people as Pinterest did a mobile update. Traffic didn’t really crash as badly as it appeared, but it took until mid-April to see the course correction. “Tried It” – While this feature isn’t available to everyone yet, Alisa got it early on. Basically, you have the opportunity to “review” things on Pinterest. So if you try a cookie recipe, or a DIY project, you can go back in and use the “Tried It” icon and write a review telling how it worked out for you, and even include photos of your own results. As more people get the option, you can see feedback from others and people can see your feedback. This could be a negative for some especially if you have trolls just leaving negative feedback for the fun of it. Notifications/Group Board Messaging – Once upon a time, the notifications were helpful; you could see who your new followers were, what people were re-Pinning, which Promoted Pins were gaining traction, etc. But now, the News feed is cluttered with information that doesn’t seem relevant to their boards. Group Board messages only come up on boards with less than 20 contributors, so you might miss an important message that you want to see. It, too, is cluttered and not super user friendly. “Picked for You” Pins – 2016 was the year you were finally allowed to disable the Picked for You Pins. It does seem that Pinterest is filling those spots with other recommended Pins based on your searches and other details. Removing Pin Descriptions in the Feed – I first noticed this when I saw my brother-in-law’s Pinterest page on his phone and noticed there were no words under the images. Pinterest is in the testing phase on this. Just realize that your images have to be super high quality and text overlay is a must. Theoretically, this would have more people click on your image in order to see your Pin description. It remains to be seen whether the desired effect becomes reality. Dimensions Changed – Even though the suggested dimensions changed somewhat, here at Simple Pin we still size all of our clients’ images at 735 x 1100. That has worked best for us and continues to do so. Pin Collective – Pin Collective is a way for Pinterest to connect brands with creatives who can help them. Even if you aren’t chosen to do content creation for a brand, you do get access to webinars on best practices. They don’t take any money from you…it’s like a matchmaking service. “How to” Pins – The issue with these Pins is that there is no indication from outside the Pin that is even is a “how to” Pin. This is why blog posts are helpful when it comes to tutorials. In a blog post, you can use more words, video, and extra details. As a content creator, ask yourself- would you rather have someone spend 10 minutes looking at your Pin? Or would you rather them spend that same 10 minutes on your website? Showcase for Desktop – This feature allows you to choose up to 5 boards that will be prominently featured at the top of your profile, and they will scroll through in an animated way. This is a great way to promote your seasonal boards. Remember, this is only for desktop, not mobile. Pinterest Explore – When Pinterest first started, we were encouraged to follow certain users; now we are encouraged to follow certain topics. They now want us to go to the Explore tab every day to see what they have chosen for us. Pinterest Stats – Pinterest has now hit 150 million active monthly active users, (40% of the new users are men), and over 2 billion monthly searches. If you have not wanted to use Pinterest for your own marketing, you need to really think that through. With 2 billion monthly searches, Pinterest is being used like Google. If you are skeptical, do a Pinterest search for your name and content. You will likely find that your content is already there, as well as your audience. Pinterest is not a platform for immediate gratification; you have to be willing to invest for the long term there. We have mentioned it here on the podcast before, but if you go to pinterest.com/source/(yourwebsitename.com), you can see every single piece of your content that has been pinned. At the very least, get a profile page up and start slowly. You can even take a personal page and merge it into a business page. If you don’t, it is a missed opportunity. Nothing happens overnight on Pinterest, so don’t be discouraged if it doesn’t take off quickly. Keep plugging along and you will see slow growth over time. Be sure to listen to the entire episode to hear so many details we couldn’t include in these notes today! And comment below with your thoughts on the changes we saw with Pinterest this past year. We sell products but dont use shopify. Should we bother setting that up to access buyable pins? You should! I think it’s a very wise move. I think in the future it will be more important. I’m not seeing buyable pins taking off the way I expected – and neither are some of the bigger brands. Do you sell physical products yet or just digital? I know they are only approved for physical right now. And I agree with ‘tried it’, not a fan quite yet. Tried it has huge potential for good as well. Think about the feedback you could get on your products and information. Valuable market research! Also, as you get more positive reviews, might it not start to improve your standing in search? It has a ways to go yet, but I’m excited about it. True on the search front. Maybe I’ve seen too many people be mean these days…. 🙁 Let’s hope for good! I am in love with this Pinterest recap … thank you so much for all of your hard work putting this together for us! You’re welcome! Thanks so much for listening and reading. Hi! Great recap. I have a questions about your dimensions: 735×1100. So you’re actually finding that horizontal pins perform better? Thanks! The Group Board Groups on Pinterest are cluttering my Home Feed. Why was I included in this? I hate this feature of Pinterest! I have tried to find out how & why I was included but couldn’t. I am now bringing my pleas to the board creators & participants. I can’t figure out who I am following to stop following so I won’t be included in the same pins being repinned and repinned etc… How can I opt out of this frustrating feature? Pinterest promoted pins offers a simple advertising module and need to just dive in and get our promotions going. Social media may not be the first place people go to shop, it has become a source of rapid customer acquisition thanks to advanced targeting capabilities that help to complete the loop for consumers with an interest in our company, brand or type of products. Promoted pins campaign is still in its early stages. This is what makes it a viable marketing idea. Eventually, thanks for sharing your experience with us.